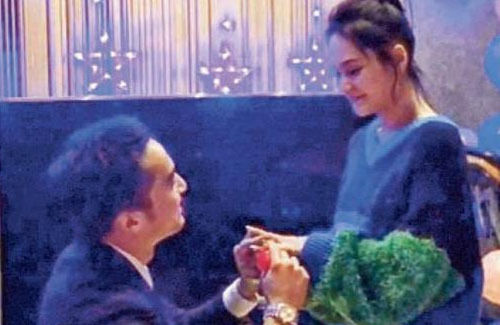 On January 31, Gillian Chung (鍾欣潼) announced on social media that she has accepted her boyfriend’s marriage proposal. The proposal actually occurred on the day of Gillian’s 37th birthday party on January 21, when she celebrated the milestone occasion with close friends and family. That day, Gillian was rushed home after performing in Macau. Gillian’s boyfriend, Michael Lai (賴弘國), arranged a surprise birthday party for her. When she arrived, she saw her home was already decorated and Michael was on one knee in front of her, holding a diamond ring. A video of this moment has been shared online. It’s been a six-month whirlwind romance for Gillian and Michael—the couple met last year and faced the challenges of a long-distance relationship, as Michael is a cosmetic gynecologist currently practicing in Taiwan. About a year before meeting Michael, Gillian went through oocyte cryopreservation—or egg freezing—to preserve her fertility. This was confirmed by her manager Mani Fok (霍汶希), who said Gillian has always wanted to have children. Oh, I am sure she knew what was gonna happen and probably already wanted for him to propose anyways. I mean look at her – she forcefully pulled out her fingers in front of him indicating for him to put the ring on her finger. Apparently the ring is 1.5 carat. I wonder if this relationship would last? What does everyone think? I don’t think the reaction was strange at all. It appears like Gillian eagerly extended her finger to receive the ring. Maybe she wasn’t jumping like a gymnist because she was rushed there straight from a plane after getting off work. Gillian has suffered a lot of insults, rejections and other setbacks since the scandal. Not to mention ignorant people sitting on a judgement seat judging her. She deserves this happiness. How long this relationship lasts is not up to us, or anyone to gossip about or ponder. Let us just wish her well in this happy time her life. If it does not work out, it will not be the first celebrity romance or marriage that fizzled. After all….. It is better to have loved and lost, than to not love, or be loved at all. there will always been gossip. There are netizen all over the world. Yes I know its not up to us to decide on their relationship. Its only a discussion. @shimmerstars you asked what we think, and I contributed my penny’s worth to the Discussion. There are comments here right now so negative about how long her marriage will last. Such negative comments. Why can’t it last… Are any of you implying it will not last because of the scandal?. For your individual information, (FYII), there are couple who dated for years and the marriage did not last even two years. AKA, Angelina Joliet and Brad Pitt. @bubbletea funny how you’re defending gillian but you’re doing the same exact thing to grace. Hypocrite much?don’t preach what you don’t practice. @moonknight , funny how I speaking about how commenters are giving Gillian’s upcoming wedding six months. The wedding has not even happened yet. Grace on the other hand, has shown that she thinks she is the best actress, yeah right. She has shown she cannot take criticism, not even from Kevin. Grace’s mouth cannot shut up, even when she is not asked questions, she just volunteers. Unintuitive percent of Jaynedyars members feel the dame way as I do about her, maybe even more, haha. I have never given her relationship with Kevin a timeline. Actually, I want her to get married, try and stop wasting her time *acting*, and have some mini Kevins. Lack understanding much???!!,haha. Don’t comment on what you don’t understand. @bubbletea I meant to say 98% of the members here feel the same way about Grace as I do. @bubbletea Agreed! We judge Grace because she’s literally spilling tea on her relationship everywhere she goes. If she stops talking, then we’d have nothing to talk about. It’s too easy with her because she won’t shut up. I love gossip, but even I’m annoyed for Kevin! @moonknight – We don’t know too much about Gillian’s relationship with her fiance. I mean, I hope they will last, but the man has a colorful history and it’s seems rushed. T@lyu310 Giillisn’s fiancee is a ladies man, it would seem. However, we can all hope he has sown his wild oaks and is ready to settle down. What is sad is when there are comments about how long the relationship or their marriage is going to last. I made a comment in reference to that, only to have some Brain addled pre-teen make a fool of herself. I guess she did not moniker herself as freethelass for nothing, lol. She is a lass or child indeed. The situation with Grace is so different. Everyone here is wise enough to know that. Would not surprise me if she and Kevin have fights about her motor mouth, her inability to listen to helpful, constructive criticism and her unwillingness to improve her so called acting. Will not surprise me if she started yapping about something as she wants to be the centre of attention, and right now, she is not. Dont know why she needs to be so high profile about her engagement, i mean the press conferences and all that. Better to keep a low profile. other Hong Kong stars have not had to go through a press conference to talk about the engagement. Good luck to them but gut feeling tells me, it won’t last beyond 5 years. At least we know they are getting married. Some HK stars, we only know they were married when they were divorced! @funnlim Lol true! Time has changed and many artists now are dating openly. that’s exactly right. Charlene Choi and Ronald Cheng is perfect example. No one knew they were married. I think it would be a short lived marriage. 6 months world wind romance would sweep anyone off their feet. In reality will it work? For all we know, he could be using her fame to promote his own business? There’s been so many gossip about him and his ex female friends/ ex girlfriends. I guess you forgot Barbie Hsu’s 20 days whirlwind romance and she is still married. However, lasting is one thing but are you blissful and happy are a different thing. I have seen couples “last” but are not happy or blissful at all. Oh really? I didnt know about Barbie Hsu. I don’t follow Taiwanese stars. I just remember her from Meteor Garden. Good for Barbie! She’s definitely a rare case, but a great love story. Agree with you – happy and lasting marriage is important. Yes the news was on here too. I was doubting that she would last but like I have said lasting is one thing, but being happy or not is a different story. In reality, I see many couples struggle to stay together to make it last but are not blissful or happy at all. I agree with you and not trying to be negative but I feel their marriage may not last. However, lasting is one thing but being happy or not is a different story. Michael is anything but low-profile! He released a statement earlier saying he wants to be low-profile but this couple has been slowly releasing little news every other day to stay relevant. I thought it was kind of rude that Gillian made her announcement prior to attending Kara’s birthday. She knew there were going to be reporters and her proposal literally overshadowed Kara’s birthday. It’s like attending a friend’s wedding just to announced your pregnancy. Totally inconsiderate. Even this short video snippet – why have it released? She even said in her press conference that she dont want to say too much about the proposal and will introduce Michael to the Press soon and he can tell everyone about the proposal himself. Wow – hello! Far from low key. Imagine if this is how their engagement coverage is going to be like, imagine their wedding – its going to be huge. @vlol yes I thought it was very rude and inconsiderate of her to announce it at Kara’s party unless she asked for permission beforehand. No one likes the limelight to be stolen from under their nose. High profile and very public proposal. Fans must be delighted. No PPRZs needed to spy on them. Looks romantic. I’m one of those weird people that actually likes Grace spilling the beans. HOWEVER, when she’s doing that more often than focusing on her acting and improving herself, THAT gets annoying – fast. It’s like her ticket to infamy isn’t acting, but her self-produced rumors and publicity. Even with that said, I have trouble seeing Grace & Kevin last. Kevin will try with all his might because she’s hot and young and easy to get along with. But I don’t see Grace keeping Kevin for life. Or it could be the other way around where Kevin drops Grace because of all the negative publicity and her love of the limelight on their relationship. Likewise, I don’t know if Gillian will last with her fiancé, but his last marriage was done-zo in 6 months. Does not garner confidence at all in his ability to keep a marriage intact. I wish her the best of luck.